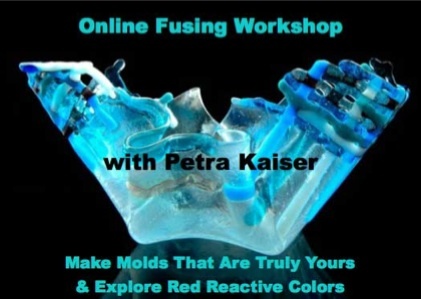 Even though you may have missed our Mold Making & Red Reactive Glasses workshop featuring Petra Kaiser, have no fear! Now you can watch the recorded event on DVD! Petra teaches you how to make your own free form molds. It's quick and easy to do. You'll be able to develop a body of work simply by changing the position of the mold elements. It really is revolutionary! Petra also explains how to fuse with red reactive glasses, which by the way, turn every color except red!! Note: This is a data DVD that contains videos, audio and multimedia Flash files. You'll watch Petra at work and she'll be narrating her technique, while event attendees chat in their questions for discussion. TO BE PLAYED ON A COMPUTER, not a DVD player!!!! 2 hours.